Sometimes a nudge from a friend is all you need, and honestly if it wasn't for their kind email encouraging me to submit something, my POINT OF VIEW quilt would likely never have made it out of my sketchbook, much less into the QuiltCon magazine. The unique opportunity to be included in the special edition QuiltCon magazine, is something I am most grateful for. It is by the same publishers who put together Modern Patchwork, so you know that the magazine is top notch. You can find in on newsstands or have it delivered right to your door by purchasing it through the Interweave Shop. 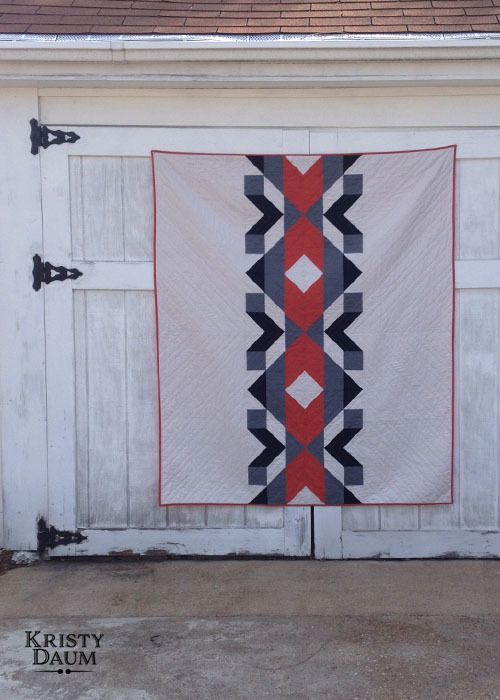 I like all of my quilts; but some of them I really LOVE...this is one of them. It includes lots of negative space and yet the center motif is very deliberate, simple and modern. Deciding how to quilt this one was a challenge as my capabilities are limited; but growing...and I refuse to send them away for someone else to do. I just prefer to make my quilts from start to finish. Okay, okay...sometimes my Mom does hand-sew the bindings, so I guess technically I don't do it start to finish. As to the quilting...I had some thoughts on what I wanted to do; but felt like I need to talk them over. So one evening I took the quilt top with me to Janie Lou, my favorite local quilt shop, whose owners are equally some of my favorite people. We laid the quilt top out and discussed several plans, some were much more complex then others. In the end, I decided to do a combination of what we discussed; which was to quilt diagonal parallel lines highlighting the V shapes along the left and right borders. As I was drawing the designs with my Hera Marker, I realized that I could create additional parallel lines within the quilting; which was certainly unexpected; but something I had to take advantage of. Measurements: Approx. 60" x 72"
I will eventually offer this as a stand-alone pattern, once the rights revert back to me. If you can't wait, I encourage you to go purchase the magazine, you will not be disappointed as it is jam-packed with 12 full patterns and lots of other quilty inspiration. And for those who attended QuiltCon, it's a great reminder of your time in Austin. Kristy, this is my favorite of all your designs. 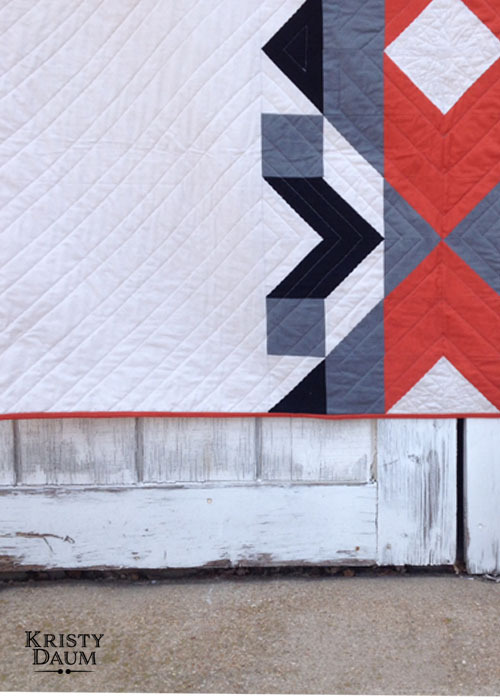 Color placement, the binding, the quilting...fantastic. Well done! Beautiful! Don't know if it's the colors or shapes or both, but it kind of has a Southwest feel to it. Really like it! I am glad to hear that you do your own quilting. Really makes it completely your creation. There's something very indigenous/Pendleton about this design. I love it!